The number of domestic hate and extremist groups in the United States grew to record levels in 2011, led by a surge in anti-government radicalism, according to a report released today by the Southern Poverty Law Center (SPLC), a prominent civil rights organization based in Montgomery, AL. In 2011 there were 1,018 "hate groups" nationally, representing a slight increase from the previous record, one year earlier in 2010, when there were 1,002 hate groups tallied. The 2011 figures are the eleventh consecutive annual increase and the highest number since the SPLC began enumerating hate group totals in the 1980s. In 2000 there were just 602 of these groups nationally. While 2011 hate crime numbers are not yet tabulated by the Federal Bureau of Investigation (FBI), the agency counted 6,624 hate crimes in 2010 in the United States, an increase of only 26 from a 14 year low recorded the previous year. A 2010 analysis by the Institute for Homeland Security Solutions found that from 1999-2009 white supremacist and anti-government domestic extremist plots were only surpassed by those undertaken by radical Salafist and al-Qaeda followers during the decade. While anti-gay and anti-Muslim groups experienced increases, the number of Ku Klux Klan groups actually declined significantly from 221 in 2010 to 152 in 2011. A handful of domestic Muslim hate groups, like the As-Sabiqun movement were not tallied, although the SPLC did an extensive analysis on these types of extremists late last year. The SPLC also saw a significant decline in extremist nativist groups that engage in confrontational activities beyond mere political organizing, such as harassing undocumented residents or undertaking border patrols. 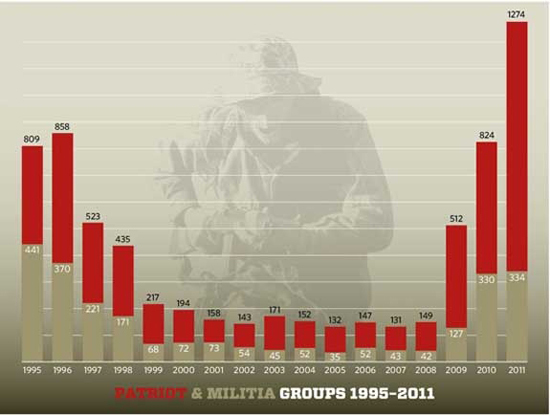 Perhaps more disturbing than the small, yet sustained rise in hate groups, is the parabolic growth over the last few years in the number of anti-government "Patriot" and militia groups reported by the SPLC. These groups, which are categorized separately from hate groups, grew 55% to 1,274 in 2011, up from 824 in 2010. In 2008 such groups totaled only 149, while in 2009 the total increased to 512. Michigan had the largest number of "Patriot" groups with 79, followed by Texas with 76, California with 59 and Washington State, with 50. In addition to the Southern Poverty Law Center, government agencies such as the Department of Homeland Security (DHS) and the FBI are increasingly concerned about the threat posed by a subset of anti-government radicals called "sovereign citizens." According to Daryl Johnson, the author of a forthcoming book on extremism and a former DHS senior analyst, "The sovereign citizens belong to an extreme antigovernment movement that believes the government is illegitimate and has no authority over them." In addition to their violent leanings he explains that: "The sovereign citizen movement has actively exploited the mortgage foreclosure crisis and promoted debt-elimination schemes and scams to financially desperate individuals." The sovereign-citizen threat likely will grow as the nationwide movement is fueled by the Internet, the economic downturn, and seminars held across the country that spread their ideology and show people how they can tap into funds and eliminate debt through fraudulent methods. As sovereign citizens' numbers grow, so do the chances of contact with law enforcement and, thus, the risks that incidents will end in violence. In August 2011 at a major national conference convened by the National Counterterrorism Center and the Department of Homeland Security, California State University San Bernardino's Center for the Study of Hate and Extremism, also warned of the threat of sovereign citizens, particularly lone wolves and armed autonomous cells operating just outside the orbit of more established vocal, but nonviolent organizations. The Cal State Center noted an increase in disturbing activity and cited over one dozen illegal incidents or prosecutions in just the previous quarter. Most of these incidents involved spontaneous violent confrontations with law enforcement, threats, or financial and tax scams. The FBI states that over the last two years there have been 18 prosecutions annually, primarily related to money scams, up from 10 in 2010. In Europe and the U.S. both, white dominated countries have become less so. At the same time, globalization has caused major economic dislocations in the West as certain industries and kinds of production move to less developed countries. Brian Levin was the Associate Director of the Southern Poverty Law Center's Klanwatch/Militia Task Force in the mid 1990s.